A small but thriving seafront town built on a hill, with views over the Severn Estuary and Bristol Channel. The town boasts an impressive harbour marina, surrounded by modern apartment buildings and some fine restaurants. 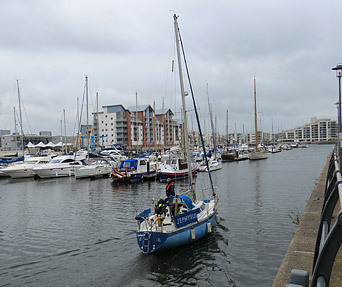 An important deepwater dock (marina) built in the19th-c. to serve the iron and steel industry), is now a popular mooring for yachts and other ocean-going craft. The area around the marina is doted with public art sculptures an is a very pleasant place to take a stroll. On the seaward side of the town there is a delightful park that gently slopes down to a shingle-lined shore, backed by a wooded hillside. The park contains traditional cricket ground, tennis courts, mini-golf and small marine boating lake. The park also contains one of Britain's few remaining Lidos (heated outdoor swimming pools). The Lido was built here because the shoreline is unsafe for bathing, due to its strong offshore currents and soft mud. On a small headland near to the Lido sits Battery Point, where a gun emplacement once stood to protect the entrance to the Estuary. The town's 14th-c. Grade I listed parish church, St Peter's, is built in a splendid Perpendicular Gothic style. Its impressive 94 feet (29 m) four staged buttressed tower is a prominent landmark in the town.